As most of you are aware, the two giants in the gaming console arena – Microsoft and Sony – have just recently launched their new consoles. Microsoft is busy showing off its Xbox One while Sony displays the new Playstation; the Playstation 4. It has been sometime since a new console was released which is why there is huge excitement around these two consoles. But fans are also racking their brains on which one to spend their hard earned money on when both long awaited consoles finally hit the shelves. To make your decision a bit easier, we’ve compiled a feature by feature comparison of the Xbox One and Playstation 4. Enjoy reading! The bout for hardware supremacy is a tie. 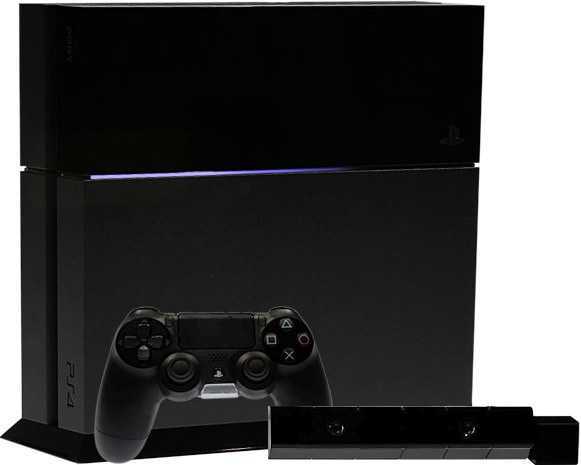 Both the Xbox One and the PlayStation 4 have similar hardware with only slight differences. Experts however believe that the PS4’s GPU might be able to throw out 50% more raw graphical computational power as compared to the Xbox One; which once fitted with its faster graphics memory could give us prettier games. 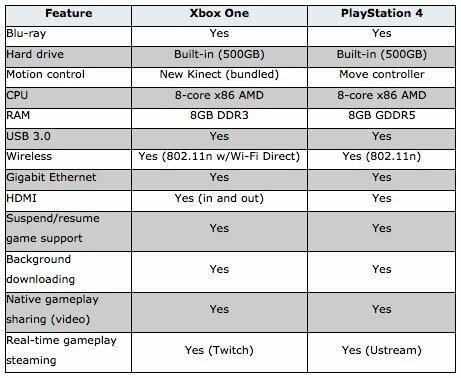 The table below provides a hardware comparison of both the consoles. As has always been the case, both consoles will have exclusive first-party (self-published) games for their consumers. So the new Halo, Gears of War and Fable will be available for Xbox One users, while PS4 users will have the option to buy Uncharted, Killzone, or Ratchet and Clank games. Microsoft also announced a barrage of titles at the E3 press conference with Dead Rising 3, Ryse: Son of Rome, Killer Instinct, Quantum Break, Project Spark, Titanfall, and Forza 5. PS4 users on the other hand will be able to get their hands on Killzone: Shadow Fall, Infamous: Second Son, Knack, The Order, The Dark Sorcerer, and 10 new indie titles. Nothing radically different here. The controllers look a lot like their predecessors. The PS4 controller has albeit been given a clickable touch pad on the front. This can be a good input for developers to think about when designing games. The PS4 controller also has a “light bar” in the front to provide motion control functionality coupled with the PS4’s Eye camera to track the position of the gamer and identify where the controller is. Motion controlling in the Xbox One is done via the infamous Kinect. 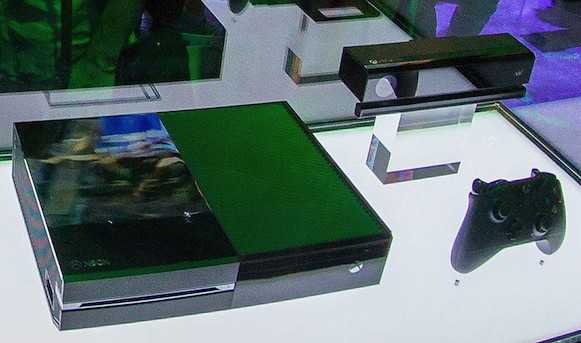 Microsoft will ship the Xbox One with their second generation Kinect. The PS4 on the other hand is compatible with Sony’s move controller and a new stereo camera but they have not yet revealed plans to bundle it with the PS4. Microsoft has pitched the Xbox One as not just a gaming console, but more as an entertainment box. The Xbox One can easily be integrated with your television and allow you to switch between gaming, TV shows, the internet, a movie, or Skype, without requiring you to switch inputs. No, it won’t replace your cable receiver, however it will let you plug your cable wire right into the box and give you full control over your cable. PS4 lacks when it comes to complete live TV integration but it does let users stream videos through Netflix, Amazon, Hulu Plus, Redbox Instant, MLB.TV, and Sony’s own proprietary Video Unlimited Service. At launch, Microsoft announced that the Xbox One would be an “Always On” device, i.e. will need to be connected to the internet for any sort of gaming. However, they have since retracted this decision and now the Xbox One will no longer need periodic online check-ins in order to play games. On the other hand, the PS4 had already announced that PS4 would also not require an internet connection to play games. Both Microsoft and Sony have not restricted the use of second hand games so gamers can borrow and rent games to enjoy them as well. This however, does not restrict third-party publishers from disallowing second hand use of their games. This is where the crux of the comparison lies. The Xbox One has been announced for a whopping $499 and will be available in November. The wait for the PS4 will be a bit longer as it will arrive just before the holidays but it will be available for a whole $100 less: Only $399! Although the Xbox One comes bundled with the Kinect, this difference in price could spell trouble for them when it comes to sales.